This is wonderful (and making me crave butter chicken now!). Your photos are gorgeous. I have a few different recipes given to me by Indian friends and I love how each one is just a little different – sort of like how everyone has their version of homemade spaghetti sauce. I will need to bookmark this, I’ve made butter chicken a few times but it never looked this delicious! What a fabulous dish! refined, tasty and so soul-uplifting. Your murgh makhani looks so beautiful. 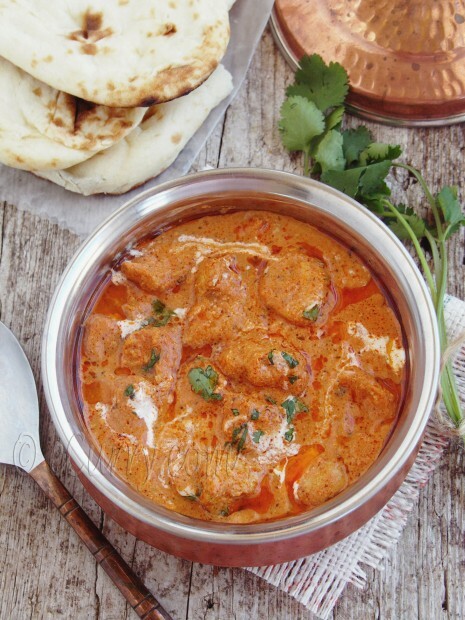 Mouthwatering, Delicious, Lavish, Awesome Butter Chicken… I have run out of words to drool over it. I’ll be posting a butter chicken recipe in the next day or two. Yours looks fab….very similar but I don’t use almonds in mine! I know this is considered popular, westernn Indian food but when made well, it’s a delightful meal and a winner for good reason! Great pics, Soma! This recipe looks fantastic! I may end up making it by the end of the weekend- thanks for sharing! Looks very good Soma. I love Butter Chicken with ruti or naan. Fab photos, but thats your signature. Lovely mouth watering recipe. beautiful pictures… ! YUM! I’ve had this at Indian restaurants and would love to try cooking this! One of my favs. Butter chicken is truly a luxurious dish, but I never think to make it at home. I’m missing a couple of ingredients, but will make a trip to our local Indian market to pick them up. I can’t wait to try this! wow, what gorgeous butter chicken!!! I prefer with naan, they are truly delicious ur pictures! first time in your blog and want to say that you have FABULOUS display, just loving it. Girl friend you know that you are my hero but after this post even more!! 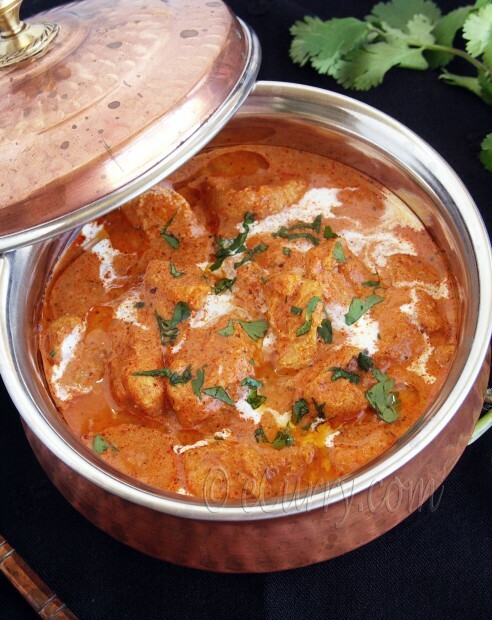 Butter chicken is my li’l brother’s hands down the favorite dish and he can eat it EVERYDAY! So no wonder this dish always reminds me of him and still I’ve barely made it myself just a couple times. Now that is one recipe I HAVE to make ‘cos it looks very much like what he would love to eat. oh my, I am speechless here..looks fabulous..this totally makes me hungry now..feel like having some of this butter, creamy chicken NOW!! As coincidence has it I just saw butter chicken on someone elses blog too! It looks so entirely delicious that I just have to make this really really soon! Yum! I’ve never had homemade butter chicken, but your recipe and photographs make me want to try making this for myself. I remember eating the best butter chicken at a hotel in India. Since then I’ve stopped eating meat but seriously, your photos are almost making me rethink being a vegetarian because this looks delicious!! Ameena Try this with Paneer (Paneer Makhani). Exact same sauce, but with paneer in it. made in the same way! this is my favourite Indian dish, no doubt! I have read and saved a lot of recipes, but yeah, the lengthy cooking process can be really daunting :D. Now I just ned some motivation! Anh, I have posted the Makhani Masala before which is used here ( have the link in this post). The Makhani Masala can be made in bulk and frozen for months (with out cream). I usually do that, and it is just a matter of marinating the chicken and grilling them. This actually gets done faster than any chicken curry as it has no onions to fry. Do give it try, if you like it! Wow! I love the look of this chicken, with all the spices needed to prepare this, I can imagine how delicious this is! This looks AMAZING! I am so glad I stumbled upon this recipe, definitely going to be making it sometime in the near future. Quick question: where do you get all of those wonderful spices? I’m not sure my local market has fenugreek or black cardamom. The fenugreek and the black cardamom are not the usual spices used in every kitchen. They are available in Indian Grocery stores. I am hoping that you have easy access to one. The fenugreek seeds are called Methi Seeds, and the black cardamom is Badi Elaichi. The dried fenugreek leaves = kasuri/kasoori methi. The spices usually have both names written on the bags/packets. Chicken Makhani is my FAVORITE. I didn’t realize there were so many ingredients! Hopefully someday I can collect all the ingredients and try to make this. It looks great. Looks spectacular, Soma! I don’t eat chicken but love this sauce with paneer! Lovely pics – I love the fact that you used the handis – reminds me of home! This looks beyond amazing 🙂 I can’t wait to try it!! I made this last night and it was delicious, so pleased. I made this 2 weeks ago it was beyong amazing 🙂 making it again for dinner tonight!! Thanks for the recipe. Hello! 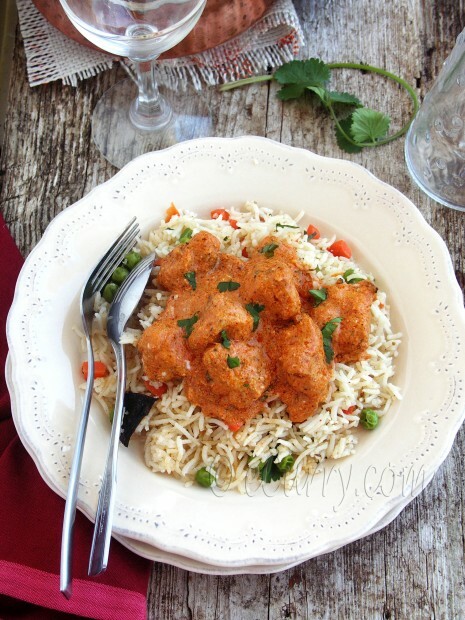 I’ve just discovered your blog while searching for a butter chicken recipe and it is fabulous! 🙂 I made this recipe exactly as written yesterday but was a little bit disappointed. My issue was the addition of the 2.5 cups of water – is that a typo? Because 2.5 cups was definitely too much, the sauce way too liquid, almost like soup. I ended up with a huge potful of sauce. It was not creamy and I could barely taste the butter. The restaurant butter chicken I’ve had is usually a lot thicker. Suggestions? Should I just let it boil longer or can I skip or decrease the water? I definitely want to make this again because the spicing/flavor was perfect but the consistency needed work. I am sorry:( If you see the photographs, you would have realized that this does have a little bit more sauce than the restaurant version. If you want it thicker, do reduce the water amount OR increase heat and simmer it longer (that will allow the spices to cook better too). If you want you can def. increase the amount of cream and butter too. I will update the post with this info:) Thank you. I am surprised that it got so watery that you had it as a soup!! When you add the water, the stuff in the pan should actually reduce quite a lot and the water simmers down – uncovered further for 15 minutes. i am so sorry for the mess:( we like to have some extra sauce to soak up the naan with it), but it never became like a soup . We want to say a big thank you for your support for the Cook & Share a Pot of Curry event. Your recipes are really inspiring, especially for all that are new to curries. Look forward to your next dish! Hi Soma, I’ve made your recipe and it turned out great; your butter chicken is as good as in the best Indian restaurant! I just have one question: what to do with the whole spices? When the sauce is done, these spices (like the cardamom, cloves, cinnamon etc.) are still there. Do you put the sauce through a sieve to get rid of them, or do you use a blender to make it nice and smooth? I can’t find this in the recipe. Thanks so much! Regarding the spices, we usually fish it out if it happens to land on our plate ;D you can either remove them once the cooking is done, or once the sauce is done and before adding the chicken pieces, you may blend them all in for them to disappear and also have a smoother sauce.. then add the chicken and simmer everything until done. Looks great, thanks for posting: Quick question – directions say to saute cinnamon, but there is no cinnamon in the list… how much, and whole or powdered? Thanks! Sorry about that! I have updated the post. Use 1.5 inch to 2 inch cinnamon sticks. One comment about the recipe – I followed the ingredient list and directions to a tee but the gravy was a little sour (presumably because of the tomatoes?). I was able to fix it by adding a little extra milk/half-half but perhaps maybe the tomatoes need to be cooked longer? The sour could be because of the tomatoes.. yes.. it all depends on the kind of tomato. Did you use fresh? or the canned ones. I doubt if the tomatoes were sour cooking them longer would fix it. If it was not cooked long enough, you would feel/taste the uncooked masala. Try using a drizzle of sugar (not much.. just enough to balance out the sour), and the cream/milk. It is safer to use canned tomatoes as fresh ones are pretty unpredictable… if it is still sour for you try reducing the quantity of the tomatoes a bit the next time. Hope I could help. I wondered, is there any substitutes for almonds/cashew nuts if its made for people allergic to nuts? I read about people using poppy seeds. Any experience with this? Being a bit scared of the wide array of spices called for in many if the recipes I hesitated to start making my own, but when i came across your blog I decided I had to give it a go and the Murgh Makhani was to be my guinea pig… Oh and what a revelation it has proven to be!!! I cannot thank you enough for your great recipes and the inspiration you provide, we all absolutely love it and even my two year old daughter gets stuck in and says “nice, nice, nice” as she munches along ( I should add that I hold back on the chillies a bit ). The process of preparing the different components and the smells filling the house is a true joy for me and how great is the reward of sittig down at the end of it and have it all dancing around your mouth, I can’t thank you enough. Yesterday I made the dish again and we had invited my mother in law over, who smilingly polished off the portion we had put in front of her complimenting me all along 😉 As we are all lovers of potatoes I actually serve it with some fried 5 spice potatoe wedges and Nan. Thank you for this amazing recepie. I made it a couple days ago and we are still eating left overs. Sooo good. I did not have any fenugreek leaves, black cardamon green chillies or lemon. Substituted Lime for lemon which made the dish a bit sour so I added honey and it did the trick. The other stuff that i left out didnt ruin the dish so i was really happy. Butter chicken is my favorite but so expensive at the indian restaurant so I am really happy i can make three times the amount for the same price. Thank you again for your blog. My family cooks alot more south indian dishes so i dont have anyone to really teach me the more north indian stuff. I was wondering if you ever tried almold milk as a substitute for almond paste in this dish. I just finished cooking your Murgh Makhani recipe. It is fabulous. The instructions were very clear and I was able to pull it off for dinner tonight. It looks just like the photos! I’ll be looking at some more of your recipes in the future for authentic Indian cuisine. Thanks! Does the butter chicken recipe not have any onions? No no onions. The Makhani Masala requires no onions. i will try it and let u know looks like amazing.thanks a lot for posting this dish. I have made this 3 times in the last 5 weeks and am currently making it again now. I have been seeking ‘the’ special recipe that would satisfy my English ex-pat wife’s craving for a good curry (and my craving developed from living in England for several years). I have 5 Indian cookbooks and have tried several recipes from the internet, but I’d never found the right recipe… until I found this one. This is unbelievably amazing – to the many posters who have commented on how good the pictures look, you must make it and see how amazing it tastes. I am planning on making this curry tomorrow night, but have a question about the tomato puree that you say to use. I live in the UK and over here tomato puree is double concentrated and comes in tubes or mini tins. It is usually quite bitter so I was surprised at the quantity which you give. But then I realised that our tomato puree may be what you call tomato paste? So am I to use this or sieved tomatoes (passata) that you can buy in tins or cartons and is just pulsed tomatoes? If you are talking about something thick and concentrated, I think it is what we call a tomato paste here. No not that one!! The pulsed tomato kind is what I mean. Freshly pulsed tomatoes done at home are good to use too. I mentioned the “puree” as the canned ones here cook faster than the fresh tomatoes with so much water content. If you want to pulse fresh ones are home, that will also work. Just remove the skin for better texture ( make a cross at the end, drop them in hot water and cover for a few minutes, remove and peel off the skin) and then pulse them. If you are using fresh tomatoes, you want to use a bit more, as the water in it adds to the volume and it will definitely take longer to cook off the water and get rid of the raw taste. So keep that in mind. ‘am here if you need help! Thanks so much. Pictures look amazing, can’t wait to try it tomorrow! I am planning on making this tomorrow for guests. Can I just use Hunt’s tomato sauce??? I advise to use a hand blender at the end then fine strain through a sieve removing any pulp, this takes time and one should use a good sieve pressing the mixture through it. The resulting texture will be very smooth. This recipe was delicious! I had to make it without the green cardamom and the fenugreek seeds, but even still, it was very flavorful. I will definitely be making this again! I couldn’t find tomato puree at my local grocery store so I was wondering if I could used canned crushed tomatoes. WWould that alter the outcome of this dish? Thank you. Really excellent, took some ‘organising’ in terms of ingredients, but turned out delicious, maybe a little hot for some peoples tastes so would just need to cut down on the ginger and chilli to calm it down, if you prefer more of a ‘korma’ heat than a ‘madras’. I tried the chicken recipe and it was delicious. I was wondering if instead of chicken can I use boiled eggs ?????????? Yes you could anything you want! I make vegetarian versions of this with Paneer (http://www.ecurry.com/blog/indian/curries/gravies/paneer-makhani-butter-paneer/) and with Lentils (http://www.ecurry.com/blog/soups-and-salads/soup/dal-makhanilentils-simmered-in-creamy-tomato-sauce/) or with Cauliflower (http://www.ecurry.com/blog/indian/curries/gravies/makhani-gobi-cauliflower-in-creamy-tomato-sauce/). You could try these too if you wanted. Tried this recipe last night and i was blown away!!!! Absolutely fantastic, some of the best curry to ever come from my kitchen. Bravo to you! I tried yesterday this recipe.It was delicious.thank you ,thank you so much. Mmmmmm!!! Just made the sauce only portion of this and it turned out delicious!! I didn’t have fenugreek leaves or green chilis but it still turned out wonderful. I didn’t make a super fine paste of the garlic and ginger and used diced tomatoes instead of puree so I just ended up putting the completed sauce (whole spices removed) in the food processor to get a nice creamy consistency. It looks beautiful and I can’t wait to add the cream when we make the full dish later this week. Thank you, thank you!! My husband’s favorite dish at the local Indian restaurant. House smells wonderful too!! I just wrote a post about exploring Indian cuisine, starting with the much-loved, and usually well-received, Butter Chicken. In the process, I discovered your blog. I am excited about reading your future posts. Thanks! I am from Germany and I was looking for the butter chicken recipe. I found your Website via Google. I tried this recipe yesterday. It was georgeous! I would like to cook this dish for my birthday party. I need four times the amount. Do I have to take the spices, cloves of garlic and the garlic & ginger paste x4 or would that be too much? Looking forward to your answer and your recommendation! Use 3 times the spices, 3 times the marinade (4 times won’t hurt), and 3-3.5 times the Makhani Masala/Sauce amount. If the sauce is extra, you can freeze the sauce for later use (without adding the cream). Hope this helps! Wonderful recipe – instead of cream try plain soymilk. It is a wonderful replacement for cream in many dishes. Thank you much for the suggestion! I have never used soymilk, but have used Almond milk and it terms of flavor it really works well as substitute in Indian recipes! any store that sells dairy should have cream/heavy cream/whipping cream/double cream. any of these will work. Do you mean that you want to subsitute the leaves (dried leaves= kasuri methi) with the seeds?? Not sure I understand the ground fenugreek. if you do not have the dried methi leaves, just skip it and use the seeds in the initial process. The seeds have flavor, but they are also bitter, so if you use too much of it, the sauce will have an undesirable after taste. I hope I answered you question. Let me know know if you have any more questions. If I were using premade garlic and ginger paste for the sauce, how much would that be in tablespoons/ teaspoons? I did it! I mean, you did it! I finally made a butter chicken just like at a restaurant. The key for me was using home made tomato purée, and finally, I had it. Thank you so much for sharing this authentic recipe, I have tried at least four recipes, and this is the only one that comes close. I’m excited to try and make it again for my whole family!!! Thank you again!!! Thank you! Thank you for trying it out, and thank you for letting me know. So glad that that it lived up to your expectations! Beautiful site. Can’t wait to try your recipe for Murgh Makhani. Thank you so much for sharing. Looks wonderful. Quick question – when you refer to tomato puree, it is fresh or canned? Would the quantity be the same for either? The measurement is for fresh puree. If you use concentrated tomato paste, use half the amount and then combine with water. The canned puree will be almost same as the fresh or may be a tiny bit less. I do have the same question as Sanju! And also, if i would be using canned tomatoes, how many cans of 400 grams should i use? The measurement is for fresh puree. If you use concentrated tomato paste, use half the amount and then combine with water. The canned puree will be almost same as the fresh or may be a tiny bit less. Not sure about how many of 400 gms!! Sorry 🙁 Empty them out and measure them in an 8 oz by volume cups size and use as the recipe says. What an amazing recipe. Tasted just as good as the best restaurant Butter Chicken. I chose to marinade the chicken overnight for extra absorption of the spices. I made a few changes to the ingredients. Instead of fresh ginger I used Very Lazy Ginger, rinsed in water and pulped in the pestle and mortar. I could not find any dried fenugreek leaves or seeds so used the powder instead, also just used normal cardamom seeds. And the tomatoes used were 2 x Italian chopped in cans, 1 can used whole the other drained of juices then whizzed with the hand blender to smooth. And I used ground almonds mixed with a bit of warm water to make a paste. Took about 3 hours from grilling the chicken to the final dish ( I relished the prep involved whilst watching a dvd and drinking a glass or two of wine), served with some shop bought sides and naan bread as we didn’t need any rice. The house now smells like an Indian restaurant but I don’t care. I will be making this for a large family get together in a few months. Thank you very much for sharing this recipe. Thank you so much for trying it!!! I love this recipe! It reminds me so much of the butter chicken we had during two years in the Middle East! I’m hoping you can clear up some confusion for me. In the “first marinade” you call for the chili powder and lemon juice, and in the second marinade directions, you call for them again. Do I double the amounts listed, or do I halve the amount prescribed in each marinade? Or are the only meant for the 20 minute initial marinade? Also, in the ingredients for the marinade you call for turmeric and fenugreek leaves, but in the directions, they are not told to add to the yogurt/mustard/masala mixture. Should I go ahead and add them to the marinade? Thank you SO much for putting this hard work online! It’s outstanding!!! I have updated the post. Thanks for pointing that out! Just follow the recipe (ingredients and time as it says now). Hope you like it! and hope I have answered your questions. OMG ! This recipe is just simply amazing, I’ve been trying it for a while and everyone who tastes it, loves it. The last time I was at one of the renowned Mughlai restaurant in the city (Mumbai), I ordered for butter chicken by default and I actually regretted it because this tastes so much better ! Thankyou so much for this. This was amazing! It took a while to make, but so worth it. I served it with fresh naan. My whole family loved it. Except for the cilantro garnishing, I did everything by the book and boy it just turned out amazing! I am so glad to find this recipe. Thank you so much for this gem and making me add this to my recipe book. Some places make it sweet. This is not good. It should have oil on the top and be incredibly delicious. This dish is not supposed to be sweet. The only sweet edge would be if the fresh tomatoes are used and they are too tart. Then a little sugar or honey is used to offset that and balance out the dish. The sweet Butter Chicken has kind of become typical of the restaurants outside India and is not authentic at all. It is done to cater to make it less spicy and more approachable for non Indians. If you get a chance do try this recipe. This is one of the most tried recipes in this blog and everyone was happy with the results. Hey there, as a chef I often look for authentic recipes, especially being a fan of western indian culinary dishes.. This is definitely one of the best butter chicken recipes I have seen, thank you for giving it up!!!! I’m so excited to try this recipe, and I have ordered online most of the spices. I have only green cardamom powder though and not black, how much would I use? I also only have ground cloves, so can you help me out with an amount there too? Thanks so much! About 1/4 teaspoon to little less than 1/2 teaspoon of the cardamom approx. The clove a little less – so a tiny pinch. I hope you like it!! I literally spent hours trying to find a recipe that could come close to a dish I had recently. This is spot on and WOW!! Thank you. I will now start trying your other dishes too! I’ve now tried this and it was sooooo amazing! Making a quadruple batch tonight of the sauce (without the cream) for the freezer so it is simpler the next time I NEED to eat it. I couldn’t find fresh green chilies, but I used 3 T of canned and it was still amazing and a good level of spice in my opinion. I blended it once it was cooked so it was nice and smooth and it was perfect. The small city I live in tried to ruin this recipe, but I prevailed. Thanks for the recipe! Very happy to know that you made it!!! I was going to make this tonight but I couldn’t undertand what happens to the spices? What do you do with the whole cinnamon stick, cardamom seeds and fenugreek? Do you grind them and if you do how do you get a very smooth sauce? You really do not need to grind them. You may just leave it there if it does not bother you. Or fish them out. Or if you would want a really smooth uninterrupted sauce, blend the sauce (tomato, spice etc) once it is done cooking and fat leaves the sides in the pan… blend it smooth at this point and return to pan. Then continue with the rest of the procedure. I have made this dish a few times, following the recipe pretty much exact – it is hands down the BEST butter chicken recipe out there!! I am happy to see that this version contains no onions, cumin, or coriander seed. While I like those ingredients, they are used in a great number of Indian dishes, and I find that what really makes Murgh Makhani special is what is left out, allowing subtle but rich flavors to shine through. For me, the characteristic tastes in murgh makhani are obviously the kasoori methi (fenugreek), but also mace. It was surprising to me that this had no mace, but did have cloves… I find cloves a bit strong for this dish. Am I wrong on this? I’m just a white guy… but stay with an Indian family sometimes, eat tons of Indian food and am getting better at cooking it all the time. But other than my preference for mace over cloves here, I think this is a great recipe and so nice to find a website full of authentic recipes. I’m all for regional variations, but many recipes online corrupt the recipes to the point that they are really inferior. I also find that not much water is needed, if the tomato puree is thin. If it’s more thick or pasty, it will need to be diluted with water. Also, many people don’t have access to a strong gas flame… and cook in small pans which don’t have surface area to reduce, so that could lead to problems with too thin a consistency. And the sourness… well canned tomatoes in the USA are quite sour and definitely need some honey (or sugar) as you have said. Imported Italian canned tomatoes are better… and pureeing your own fresh tomatoes is best (in my experience anyway). When I make this I cook the tomatoes with cardamom, mace, etc. and BLEND/PUREE it for nice texture. I then re-cook it with the ginger-garlic pastes and green chilis. But it is significantly more time and work. This version is much easier and less time. Your are right that Makhani Masala does not have cloves. If you click on the original makhani masala I have linked to, you will see that I have not used clove in that. But I myself (and family) find the smell of meat a bit strong sometimes, so I have started using cloves. But if you see the amount I have used, you will not really decipher it in the sauce. I have never used mace, but yes that would be more appropriate. Yes the water amount/reduction time would need to be adjusted with the kind of tomatoes used. Some others who have tried have mentioned that it was watery, but I guess one has to watch and do that as they want it. And yes sugar or honey needs to be added to nullify the tart. Each kind/brand of tomatoes are different. So that needs to be adjusted per taste too. You would not need to follow this recipe! Follow yours 😉 I am sure you are doing the right thing and even better. Blending the tomatoes with the spices is better as they grind the spices and the tomatoes… some who are not used to whole spices popping in their plate or mouth benefit better from this. And about my blog – I try my best to experiment and try out original recipes. Cuisine in India is so vast that I would have probably only tried five percent of it. But when I try something, I try it many times and match up closest to how it should be and then make changes I need to. The goal is to have the original out. That is why I always mention in details if I have made changes and what difference it can make. I think it would help me if I was going to try something the very first time and I hope I can help others with that. Made this dish, for my work colleagues and it turned out brilliant. I am a fan of spicy food, so I added a bit too much chili powder. The only negative thing about this recipe, is the long time it takes and the many processes but it was very good. I will definitely use this recipe again! Thank you so much! Yes it does take time, but you can make the Makhani Masala beforehand (without the cream/dairy) and freeze it. It takes very little time if the masala is already made. Any good dish has processes that take some time… No complaints, just praise! It was a fun cooking experience (indian cuisine is somewhat new to me), with fantastic results. Authentic and delicious! I liked it so much, I immediately made it again the next day 😉 I look forward to trying more of your recipes. Thanks so much for your recipes, and great photos as well..
Hi! I am trying your recipe and im stumped. The sauce says to use 2.5 inches ginger made in a paste. So I actually made a whole batch of paste and now I dont know how much paste equals 2.5 inches! I am going to wing it but id really like to know for next time. Same with the garlic. How much garlic paste equals 8-10 cloves of garlic? It does not mean that the paste should amount to 2.5 inches in depth. Do you have the nutritional information for this dish? I have recently started the Dash diet and I am trying to see if I can eat this! It looks so yummy! I have to confess here and say that I do not have a clue! Is there a place where you can stick in ingredient list and have them calculate?? Sorry! The sauce should not be tart at all! They might be little tart but that can be balanced out with the sugar or honey that I mentioned. What you have tasted in restaurants is the right kind of taste without tart. Different restaurants out of Indian might do it differently, good or bad, but the sauce should never be tart. Its smooth and creamy with a well balanced flavor. I think the tomatoes you have used must have been tart. Or they were not cooked enough? It is probably the first reason. If you still have leftovers and you are willing to make up I would add more cream and some sweet to balance out the taste and make it edible. It might not be what you wanted but it would be edible at least. i am so sorry. If you are willing to give it a try again maybe use the canned pureed tomatoes to be on the safe side? Am here if you have any more questions. Hey Soma!Hope u r doing well and good! I have this habit of trying Murgh Makhanis, and have tried many , really many of them. I wanted to try this recipe of yours for quite a long while and finally did it yesterday. Inspite of me being a fast cook,it took me quite a while to cook. I have used canned tomatoes, by grinding them. But rest all I followed pretty much the same and by eye balling the measurements to suit my family needs. Came out well. Initially, I thought the smell of methi seeds were over powering, but then it mellowed in towards the end. But I would reduce it to 1/2 tsp next time. On another note, the tartness others mention is because they have not cooked tomatoes enough I suppose. Because I used 2*400 g cans and still it wasn’t tart. The cooked tomato in the picture was of great help to understand how well it needs to be cooked. Thanks. Just wanted to know if we can fry the chicken after marination or is it necessary to grill them? You mean deep fry them? I have never done that and besides the chicken in butter chicken is usually cooked in tandoor. It the outside toughens, it won’t absorb any flavor of the sauce. You do not have to have an outside grill to grill them. Coat a skillet with oil or oil spray and lightly cooked the chicken on the stove top in a skillet. Or you can broil them in the oven. If none of these work for you, you can fry them, but it will be difficult to expect the traditional taste. Butter chicken with Indian “rice” | Shut the Chef Up! Hi there! I’m making your butter chicken tonight! I’ve been searching for this authentic recipe for a long time so I can’t wait to try it! I have a question though, when you say: After the tomatoes are cooked down, you might want to blend the sauce into a smooth puree… I’m assuming we have to take out the cinnamon sticks, cloves and leaves, right?!?!? And then you put them back?? Please confirm, I wanna make this perfect! 🙂 Thanks. Thank you for this recipe! My husband and I loved it, and he declared it as good as our favorite curry in our favorite restaurant! Thank you so much for trying! Thanks Soma. This recipe of yours was yummylicious. Made butter chicken for my guests and they just loved it. Coriander Chicken with Cilantro Rice | Never Enough Thyme — Never Enough Thyme - Recipes with a slight southern accent. I was very pleasantly surprised by this recipe. I made a few changes and I think that just made this perfect. Instead of yoghurt for the marinade, I used heavy cream for the marinade. I have used a combination of heavy cream and yoghurt in the past but all heavy cream is just fantastic. Bye bye dry grilled chicken! I also straight up just used tandoori chicken masala for the marinade. I stuck everything on skewers and grilled away. I think it’s very important to get those smoky grill marks for true tandoori flavor of the chicken. Second, I highly recommend canned crushed tomatoes from the grocery store to get the right texture. There is no blending needed if you use canned tomatoes. Also, instead of water I suggest using just a cup of chicken stock. So much more flavor! Third, I used cashews instead of almonds. I know for a fact that true butter chicken needs cashew puree. Other than that I used everything in the exact proportion as it was said in the recipe and mind was blown! Thank you. If you show me how to make perfect butter chicken, rest assured i will be coming back to read your blog. Thank you! All the changes you made are really good changes. The cream in the marinade works wonders. I have the Malai Tikka recipe which uses cream. See here (http://www.ecurry.com/blog/starters-snacks/murg-malai-tikka-kabab/). The yogurt is a natural tenderizer, so the use in the marinade. Yes cashews are used in original Butter Chicken. Glad you liked it! Just to let you know we enjoyed your butter chicken as a part of a doctorate celebration feast yesterday! 🙂 Thanks for the delicious recipe. Sorry the recipe did not work out for you. btw the sugar needs to be adjusted to your taste. honey is used too. And I really do not have much control over the sourness or how sour the tomatoes are going to be..
OOOhh this recipe is amazing, takes me back to my childhood Orange Gravy Chicken ( I was a kid back then remember, no idea what they called it on the menu) at the Maharaja Restaurant in Southall, Middx, UK. So easy to make(I always have ready ground chilli, ginger, garlic cubes in freezer). I have even taken to freezing precooked marinated chicken so this is a mid weeker too!! This looks amazing. Can’t wait to try it out. I’m just wondering if the cinnamon sticks and cardamom pods should be removed before pureeing the sauce. Thanks! No need to respond to my previous post I just found my answer in the comments. Thanks. Just made this for dinner. AMAZING! Thank you. My 9 year old just recently discovered that he loves Indian food and helped me make it. It was not a hard recipe to follow. My blender is terrible so I did not want to blend everything together. I removed the cinnamon stick, cardamom pods and cloves. I then ran my immersion blender through it real quick and returned the cinnamon stick etc for the remainder of the cooking. I removed them again before serving. Can’t wait to eat the small amount of leftovers we have tomorrow. what size of chili peppers are you using? I have an Anaheim and a poblano. the Anatheim are about 5 inches long and about 3 inches in circumference. I usually use the small Thai Bird kind of chili peppers. They have the strongest flavors. But you can use whatever you want. Maybe just 1/4 of the Anaheim? more won’t really hurt that much. When do you add in garam masala? It says in the recipe: when you add the cream. Excellent recipe – I have made it twice in one week. Still experimenting on getting the correct combination of peppers. I haven’t seen Thai Bird chili peppers where I live – will keep looking. Thanks for posting this recipe – it is extremely satisfying! Thank you so much for trying 🙂 Not nescessary to use the Thai bird. Smaller chillies have better flavors so I mentioned. Any chillies like serrano or smaller works. smaller the better. Thanks for giving the recipe of Murgh Makhani. It looks really outstanding in pictures. Although I don’t eat meat but I will certainly pass this one to my friends who eat it. Indian food is well recognized for its taste and spices all over the world. I appreciate this recipe, I do, but it was a bit infuriating..
Why aren’t the sauce ingredients listed in order? And why are the directions for cooking the chicken before the directions for cooking the sauce which takes much longer? Also, there was so many recipes within the recipe with all the pastes (warning for that would have been nice.) What does this mean: “1 tablespoon red chili powder/cayenne pepper/paprika or to taste” Is it all of these or one of these? Is it necessary to put so many of the ingredients in at separate times? With the nature of this recipe, it seems more like the reflection of a scattered cook. Hate to seem ungrateful.. but yikes! I am sorry for your inconvenience. The ingredients are listed pretty much in order as it needs to be processed. The pastes need to be made before hand, the spices go in the butter or oil and the tomato etc. The recipe of chicken is written before becoz that can be something which can be made before and set aside and just added when the sauce is ready. I assumed that would be the order of convenient cooking instead of cooking both at the same time or the chicken later. The chicken can be grilled way ahead of time. There are links to the recipes which has already been posted before in the blog. There is no point repeating these in every single recipe. The red chili pepper or paprika or cayenne – can use any as the heat level is different for each and it is a personal choice to who uses what and how much. The recipe is written in pretty much in the exact order it is cooked given that the sauce and the chicken can both be cooked ahead and assembled later. Thank you so much for this recipe. I am absolutely in love with butter chicken curry. I have tried this recipe before, but made a number of edits to it. I’m trying it tomorrow with no changes, hoping for a better result. I therefore have two questions I hope you might answer. 1. I can see that you mean for the chicken to be separated from the marinade when it is grilled, other than to brush on some of the leftover marinade while it cooks. Do you throw it away after that? Or do you add it in to the sauce? Or do you freeze it and reuse it? My instinct is not to throw away so much wonderful flavor, but I didn’t see any direction which says you add it to the sauce. 2. I’ve had a problem with most of the curries I’ve made from scratch that they turn out weirdly gritty. I was wondering if you have any advice on how to avoid that? When you grill the chicken, some of the marinade will already be coating the chicken pieces. You will not need to wipe them off. The amount given here will not leave you a whole lot of extra marinade. You may baste with this if you wish while grilling (I have updated the post). If you have extra you can freeze it for later use :). Do not add it to the sauce. The reason being it has yogurt and the yogurt might split in the heat while cooking changing the texture and taste of the sauce. Regarding the texture of the curry, I am not sure what curries you have made. If they were gritty, is it the onion paste that you have used? If onion paste is used and if that is not cooked well and the right way, the texture will not be smooth. If you have used yogurt in your curry and if that happened to split, it will leave grains in the curry. I am not sure what exactly happened. This recipe has instructions to blend the sauce after it gets cooked down. That will help you get a smooth restaurant style sauce. The sauce you find in restaurants are all very smooth. However home cooked curries are not exactly the rich and creamy restaurant style, so the texture to them is usually different. Not sure if I could be of any help! I just had a question about salt – how much salt does the first marinade and actual sauce require? It’s not listed in the ingredients and the amount is not listed in the directions for both parts of the recipe. Please let me know what amount would work best. Thank you. I never mention the amount of salt in the recipe because each one has its own requirement and tastes when it comes to salt. You will have to try and see how much works best for you. Sorry for the inconvenience. The Recipe Blog < Loved it! I noticed that recipe is almost identical to the one published by Gordon Ramsay in his indian cooking recipe. He just did not add the fenugreek leaves I believe. Did he get the recipe from you or vise versa? I am wondering if the other recipes in his book will be good. I have not seen Gordon Ramsay’s recipe. Could you please tell me which book it is? No I have not taken the recipe from him. I have been using this recipe for the past many many years. The recipe for the sauce (see the link in my post) has been adapted from a book which was published by an Indian restaurant many years ago… but it went through a lot of changes over time. The dried fenugreek leaves are sort of vital for the flavors. very nice dish.By looking at the images started mouth watering.I feel Butter chicken is not spicy.when we are tasting it.we can feel milk content as well as chicken taste.At once two tastes .This is an awesome dish.Butter can blended with roti,chapathi ,naun to have it.Thanks for it. It is available at amazon. I think he eliminated the fenugreek to make it more accessible to the average cook. Thank you!! He is one of the best chefs out there. And to make a good Makhani, the recipe cannot be too different from the original. Like no onions are used. However you will see recipes which are not so authentic with onions in it. Whatever he did, he must have done it right 🙂 However if you do have access to fenugreek, use it. It does make a difference in the flavor. A big difference. hi, I just made this recipe and followed it till the end. However, the taste of the curry is a little sour (like a tomato paste) and the colour is still red and not orange like your picture. If it tastes like tomato paste that means I assume that it has not been cooked down completely to get rid of the raw taste. The sourness is also because of the tomatoes not being cooked down and also you will need to adjust the sugar or honey to offset the tart. The orange hue comes from the combination of cream and tomatoes. So if the tomatoes have not been cooked down completely to release the oil/ghee on the side and the cream has not blended in well… that could be the reason. Try to simmer it further for longer and see if it works and the raw taste goes away. Also add the sugar and honey to adjust the tart. If needed add more cream at the end. I made this twice. The first time it was sour and the second time it was perfect. Exactly like my local restaurant. The difference: the tomatoes. The first time I used canned tomato puree and it ended up tasting exactly how you describe which is sour.. like tomato paste. The second time I bought Italian tomato puree from a jar (called strained tomatoes and the only ingredients are tomato and salt). The Italian jars are must sweeter because they don’t add citric acid. Try it again with these and I guarantee this will taste totally different. Thank you for the recipe! I made this tonight, however without the almond paste because I forgot to buy it. It turned out wonderfully and I look forward to making it again, with the almond paste this time! My favorite restaurant doesn’t serve it with fresh cilantro and it really elevates the dish. Thank you for sharing! Hi just wondering when you purée the sauce do you take out the whole spices like the cardamoms cinn and clove or do you purée them into the sauce? All right. all I got to say is that this tastes nothing like the butter chicken back in India. The way you marinated this chicken was similar, but still wrong. I THINK YOU SHOULD GO TO INDIA AND GET THE CORRECT RECIPE. If any one would like my recipe than this insanely wrong person than reply to me and i will give out the right recipes. Why do people not understand that not make this dish correctly, you are embarrassing and making fun of my culture. LONG LIVE INDIA. 1. Marinade chicken with 4 tbsp of yogurt, lemon and other spices for an hour. 5. In your pot, add 2 bay leaves, cloves, cardamom and fry for a minute. Add chicken and fry it till its white. 6. Now, add onion and tomato puree and tomato paste. Add salt, turmeric, red chilli pwd, mango pwd, brown sugar and cinnamon. 8. In the end, add fenugreek leaves, black pepper pwd, garam masala. Give the dish another minute or two. I am an Indian and I grew up in India. Having said that I am well aware of how Butter Chicken tastes in India. If Indian culture is yours, being an Indian myself I will say I am proud of my culture and no I am not making fun of our culture. 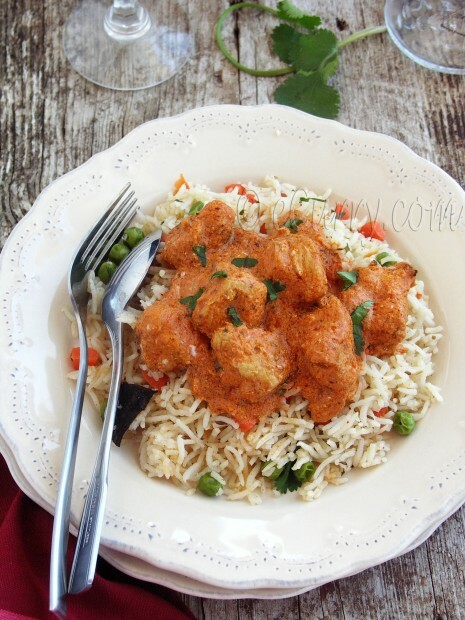 This recipe is an adaptation of a recipe from a famous Indian restaurant. And this is closest to the taste I have got to any restaurants selling Butter chicken in India. Thanks for your recipe, but I will continue to follow mine, First of all in any good butter chicken recipe, the chicken is NOT fried in the pan with the masala. The chicken is first cooked in the tandoor and then added to the prepared Makhani sauce. 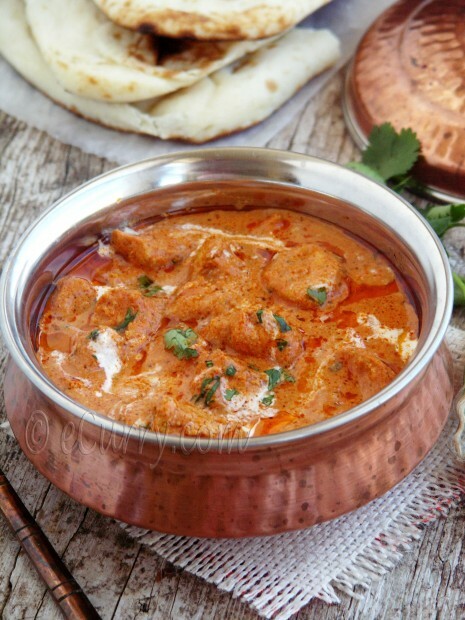 The tandoor cooked chicken adds the flavor to the butter chicken. Where we cannot have the tandoor, the best bet is the grill for the smokey flavor and the juicey bites of chicken. Secondly the “Makhani” does not usually use onion in the gravy. Chicken tikka masala uses onion. I have never heard of aamchur being added to make Butter Chicken either. 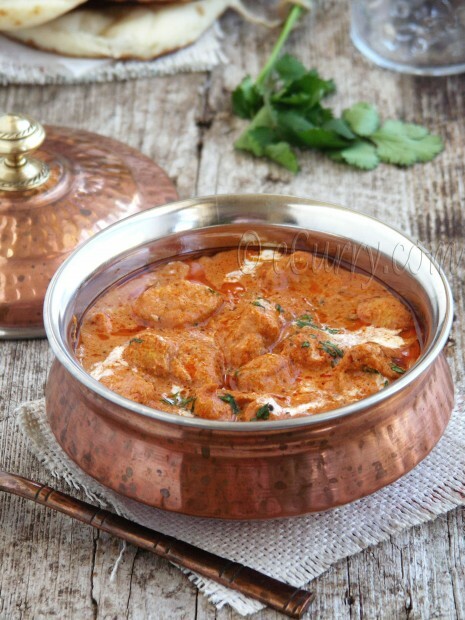 The flavors of Butter Chicken mostly comes from the fenugreek seeds, cinnamon, ginger garlic paste, good tomatoes, kasuri methi and of course the cream/makhan. I wonder if you have tried the recipe you commented on, to say so strongly that it is not the right recipe. If you do not like it, you may stick to your recipe. And I will stick to mine. So I made the recipe and my husband who is indian from Jaipur said to purée all the spices. I didn’t get a response from my previous post and have a baby and a toddler I didn’t really have time to scroll through hundreds of comments to find the answer. Later on I did see that you said to pull the spices out if you were going to purée. I’m assuming this is not including the methi seeds. Is pureeing optional? So it came out ok but I realize now I wasn’t supposed to purée the spices. Also next time I will use fresh tomatoes instead of canned sauce….I’m determined to get this recipe down!!!! I am sorry I had missed your previous comment! I apologize. Your husband is right. Puree the spices along with the tomatoes if you are blending the sauce for a smooth texture. I did say to blend everything together, which includes the spices. The pulling out of spices is only if you are not wanting the spices in there and if you are not blending the sauce… Sorry for the confusion. I will update the post and be more specific. Its better the spices remain in the sauce (whole or pureed) as they release the flavors over time. Also a reader who tried out mentioned to use good quality whole canned tomatoes (sweet italian kind), instead of the paste to avoid the sauce getting sour/tart. That is if you are not using fresh. I have tried several recipes but this one is the best. The butter chicken I cooked was perfect and tasty. I highly recomend. Hi I’m making this dish tomorrow night for the in laws and I have bought all of the ingredients. About the fenugreek. I’ve bought ground fenugreek and I’m not sure how much to use. Can you help me please? I am not exactly sure: use about a teaspoon. But once it hits hot oil, the powder will cook really fast. Put the next ingredient quick enough so the powder does not burn. I really liked your recipe. I made it today after spending some time collecting all the ingredients and making some garam masala. So good. A bit more flavourful than the new Asian village restraunt close to my home. I think I needed to grind all the spices and remove the pods husks from the cardamom before adding them to the butter. There were a few hunks my blender didn’t pulverize. Also used cashews instead of almonds because I forgot to get some. All in all it was the best curry I have ever produced in my kitchen. I made this today and all of my family had 2nd serves and licked the pan clean! It was worth firing up the charcoal grill for the chicken and all are asking me what I will cook next. It was fun to cook and delightful to eat – thanks and happy cooking! That looks absolutely yum!! I was wondering would it be ok to use green cardamoms instead of black? I guess it may alter the taste but would it be significant? If using green cardamoms, how many would you recommend? What a lovely site you have created – thank you! I found your post for murgh makhani as I was doing some additional research before posting an American-ized, slow cooker recipe on my site. I just love discovering other people around the world who love food and take good care to make it at home. Beautiful work on eCurry. Cheers! Looks and “sounds” fantastic Soma! We love how the Indian cuisine combines so many spices! Unfortunately we never found fenugreek here in Athens, so is there a chance we can omit this or substitute with something else? In this recipe both the seeds and the leaves are used and each of them have different flavors. If you can get the leaves without too much trouble I would recommend that you definitely use them as the leaves offer the final depth of flavors. Hey, just made this tonight! It’s fantastic! I didn’t add the water though, just added 1 pint of cream instead. I am cooking this butter chicken recipe at this moment. For a beginner in Indian cooking, I am finding that there are some parts I am not sure what to do or how much and I wish there could have been a few more specifics. Eg How much ghee and salt. I was a little unsure where to brown the chicken after the first marinade (I didn’t) or do you scrape the marinade off before frying. After you have sizzled the black cardamon, cloves etc. do you keep that or discard and just keep the oil? I have kept mine in but now have a dilemma of whether or not to take the vanilla pods, cardamon out before blending. 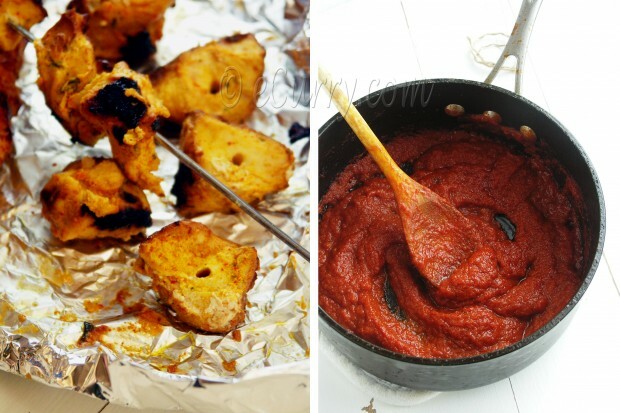 Do you combine both marinade and sauce when blending? Would be wonderful if someone who knows is online as I have got to the last stage with the tomatoes simmering. No need to brown the chicken after the first marinade. The chicken is cooked after it sits in the complete marinade. You do not need to scrape the marinade off, but pick the chicken from the marinade and grill or cook them. The extra marinade may be used for brushing as the chicken cooks. The amount of ghee or oil for cooking the chicken is as little as it takes to grill/baste or a thin layer in the pan for the stove top. The marinade is not used in the sauce. With the spices, you can allow them to stay whole in the sauce (we Indians are used to this and usually dont get bothered.) or you may remove them after getting cooked. Or you may blend the sauce with them for a smoother consistency. Well it was a big success. I doubled the quantity and used one can of Italian tomatoes and the rest tomato puree. I found I needed to add a little more honey to the recipe and a tad more cream. However, many compliments. It would be wonderful if you could add exact amounts of ginger which comes in different sizes. Perhaps you could grate it and then work out how many teaspoons it makes. Us beginners like to follow a recipe exactly when we first make it. Anyway it was a success so thank you very much. Thanks much and I am sorry for not writing back in time. I will try to edit the recipe, and watch the amount next time I make it. Regarding the Paneer, there are so many kinds of sauce it is hard to tell. Was it an orange sauce like the Butter chicken? Butter Paneer Masala or Butter Paneer does have a cashew paste in the sauce. Let me know and lets see if I can find it for you. I have a Butter Paneer/Paneer Makhani recipe in the blog. If it was a white hued sauce it will be something different. Hi, in the process of making this. When you say 1 tablespoon red chili powder/cayenne pepper/paprika or to taste – does that mean 1 tablespoon of each or choose one of the ingredients and not the others. i.e. does the “/” mean “and” or “or”? Thank you.this recipe actually says 2 mangoes!! I would think on an average one mango is abot 300 g… approximately. I used pretty large mangoes. I hope this helps you calculate how much you would want to make and how much you need to use magoes from your yard. Or…. you can use any one of those depending on your tolerance of spice level or availability of ingredients. I apologize for the delayed reply. Do you by chance have this recipe on Pinterest? (Yes the Murgh Makhani is one of the pinned posts). I hope I have answered your question! Thank you very much for this wonderful recipe. It was detailed and exact, very helpful for a beginner like me. I especially found pictures of the chicken after grilling and the tomato sauce base very useful. Can’t wait to try this. Question about the almonds and paste. Do I just blend the almonds alone into a pasty substance, or do I make an actual almond paste (in which the recipes I’ve seen call for confectioners sugar, etc). Also, which do you recommend, almonds or cashews? Assuming almonds since it is in your recipe and if so, wondering why you like the almonds better. This looks just like the One and only Butterchicken I have been looking for! I grew up in a little village in The Netherlands, where we often used to go to this amazing Indian restaurant Taj Mahal. Ever since I have been in many mant different places, and countries and often went to Indian restaurants, but never ever the butter chicken was as good as in Taj Mahal.Nowadays I live in Ibiza with my own family, and whenever I go back to Holland, I get my family and friends to have dinner at Taj Mahal. So, long story short: I really think your recipe is the one to make, ONLY, since about ten years I am a vegetarian. So what do you think: would this be as nice made on a vegetarian base? To use mushrooms or some other vegetable instead of chicken? Love this stuff, however cannot imagine doing it from scratch. My dad used to do a curry that was a lot like butter chicken. Still do not get the Butter Chicken title. Butter is literally not involved! This is stunning, a brilliant recipe. 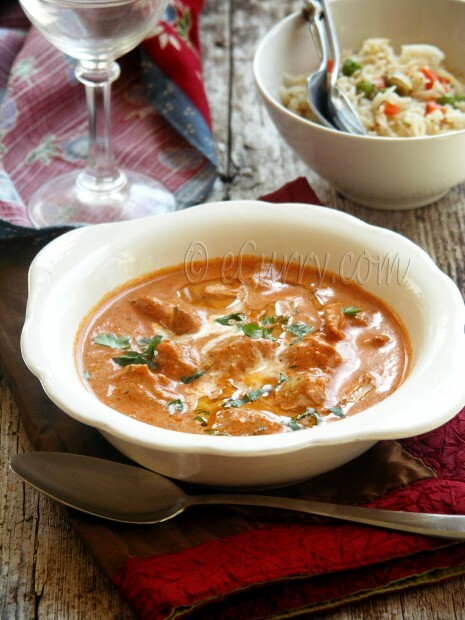 I love butter chicken so much and this is the best recipe on it that I can find! Thank you for sharing! I made this last Saturday and it was delicious. Thanks for sharing this post. What can be used inplace of almonds for nut allergy sufferers? Skip the nut. If the allergy is only in almonds you can use cashews or else ots okay to skip the nuts. If you are very particular about the conistency I am thinking maybe a bit of soaked poppy seeds? that could change the flavor slightly though and also the texture. I had this for the first time a couple of days ago and it is amazing!! Incredible flavour. However, I took a bite and bit into some type of spice and to me it was so bad I couldn’t finish the dish. Any idea what that is so I can make sure to push them aside next time? Thanks so much. If you do not want to bite into spices (and I completely understand that. Spices flavor the dish but sometimes are not so pleasant by itself), blend the mix once done cooking but before adding the cream and chicken. That way the spices blend in and the sauce is smooth too. Hi there, I have just made this and am waiting for my guests to arrive. I have made curries before since my ancestors came from Hyderabad but it’s the first time I have followed a recipe for one. I’m sure it will be lovely and will let you know after they’ve eaten it. One thing, I had to leave the chillies out as one of the guests can’t eat hot food. Shame.